Bluegrass Vascular, founded by John Gurley, M.D., is dedicated to developing innovative lifesaving devices and methods that address limitations with current vascular access procedures. Many patients rely on permanent vascular access to receive vital therapies such as hemodialysis, chemotherapy and nutrition. While permanent access can take 4 months to mature, hemodialysis patients receive therapy via a central venous catheter (CVC). Bluegrass Vascular has developed a Don’t Go Left™ approach to reliably and repeatedly restore access, which avoids using left-sided veins. Our unique approach is designed to improve patient outcomes and reduce cost of care. 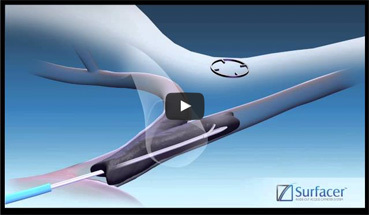 Introducing the unique, minimally invasive Surfacer® Inside-Out® Access Catheter System.